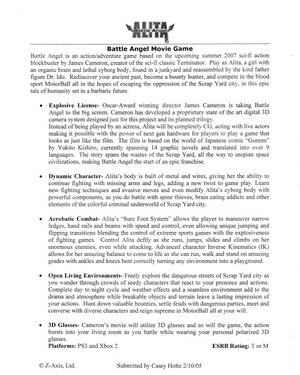 Alita: Battle Angel finally made it to theatres this year, long after James Cameron first bought the rights and tried to make the movie in 2005. At the time, a young game designer at Activision thought it might be the right time to pitch an Alita video game. Casey Holtz has worked in the game industry for 14 years, and has credits on titles like Friday the 13th and Activision’s licensed tie-in for the first X-Men movie. He’s also a longtime fan of Aliita. He was enraptured by the coming-of-age tale set in a violent dystopia, and especially by Alita herself. Holtz has a considerable collection of Alita stuff: the Japanese PlayStation 1 game, a resin statue, art books, et cetera. In the early 2000s, before Holtz entered the game industry, another Alita superfan was making moves on turning the manga and anime into a Hollywood blockbuster: James Cameron. By 2003, Cameron’s Alita was in proproduction, and by 2004, it was slated to be his next big project. Then the film was delayed for another of Cameron’s passion projects, Avatar. In 2005, though, it seemed pretty likely that an Alita movie might very well happen. 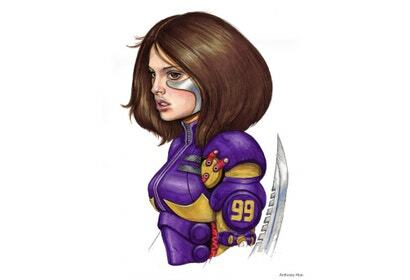 So Holtz wrote a one-page pitch on an Alita game, and an illustrator friend who worked for Activision at the time, Anthony Hon, made some art to go with it. Holtz wrote that you’d play as Alita, “a girl with an organic brain and lethal cyborg body.” He boasted about Alita’s agility and speed, in particular her “Sure Foot System,” which would allow players to manoeuvre in narrow corridors and on top of handrails. “The story spans the wastes of the Scrap Yard, all the way to utopian space civilizations, making Battle Angel the start of an epic franchise.” He anticipated that the game would come out for the PlayStation 3 and the then-unnamed Xbox 360. Holt and Hon met with Activision management, who turned their pitch down. “At the time, it was my first year as a game designer in the industry, so I sincerely appreciated the management meeting with us and letting us pitch the game in the first place,” Holtz said. “I think there were some concerns that the property was lesser known in the U.S. and Europe. Holtz said that another studio ended up getting the licence for an Alita tie-in game. Still, he has some thoughts on what it would have been like to play the game he pitched. Holtz pictured the game as an open world where players could explore Scrap Yard City, tracking down bounties or playing Motorball at their leisure, while also playing through missions that would take you through the manga’s plot. In particular, he was excited by playing as Alita herself, who is an ultra fast, strong, acrobatic cyborg. “In the manga Alita uses her environment to vault off to strike her opponents. When facing bigger enemies, she sometimes has to climb up their limbs or grapple them reach their weak spots. We were thinking some battles could play like a faster Shadow of the Colossus, which came out the year we pitched this game,” Holtz said. Holtz also said that when you’re designing games with more than one prominent mechanic, it’s almost like designing two different games at once. He thought that Activision’s extreme sports games like Tony Hawk Pro Skater could have laid the groundwork for Motorball. Still, he now thinks that making a game like the one he envisioned for Alita might not have been possible in 2005. “In hindsight it was probably for the best that the movie and game were not made at that time, as the technology in films and games was not ready to do the world of Alita justice. The things we can do now in Unreal Engine 4 absolutely blow away the engines of that era in all regards,” Holtz said. Now, though, the time may finally be ripe for the fast-paced, open world Alita game Holtz envisioned. He’s seen the movie and loved it, saying that it was clear how much Cameron, director Robert Rodriguez and producer John Landau love the source material. Movie special effects have caught up to Alita’s world, and so have games. Holtz has a few suggestions on studios that he thinks would nail it. “If a developer were to do the an Alita game now, I would love to see it developed possibly by Sucker Punch, Insomniac, Platinum Games, From Software, or maybe even the Assassin’s Creed team,” Holtz said. Reminds me of Oni, or perhaps it should be the other way around?